The perfect rocker for your home or business, this handcrafted Blue Mountain Hickory Rocker will offer you years of comfortable enjoyment with its top quality construction and durable hickory wood frame. Take a moment for yourself while relaxing in the quiet of your front porch or enjoy the company of friends and family while gathering around the living room in this beautifully crafted and authentic Amish Hickory Rocker. Because this unique Rocker is built from solid rustic hickory wood and handcrafted by our talented Amish craftsmen, no two Hickory Rockers are exactly the same. The hickory twigs are steam bent and expertly shaped to create the unique look of this rocker. This Amish Hickory Rocker will no doubt become an heirloom piece in your home and family that gets passed on from generation to generation. 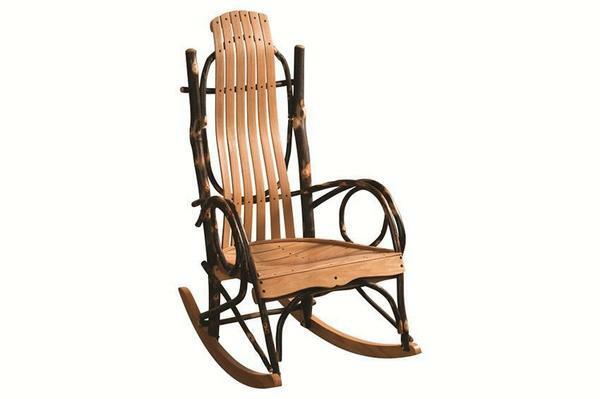 The Blue Mountain Hickory Rocker usually ships in 6 to 8 Weeks. Contact one of our Amish Furniture specialist before placing an order for additional information or custom ordering assistance. Call toll free today! 866-272-6773. Order six or more rockers and we are happy to offer a discount on your order. Check out our Big and Tall Hickory Rocker for a little extra room. I received my chair and it is much more than I expected. It fits me perfectly. And the craftsmanship is magnificent.